My first visit to the Highline on the west side of Manhattan. I'd read about it last year and was very much looking forward to visiting in person. It is such a cool place. The history is palatable and the environment is so unique to be right in the middle of the city. For those that don't know, the Highline is an elevated park above the streets of Manhattan. It stretches from 30th street down to just past 12th street. It was created on the old elevated railroad tracks that were originally built in the early 1900s. The tracks fell completely out of use by the 80's and began to be reclaimed by the forces of nature (trees and vegetation started to grow on the tracks). Rather than tear it all down the city transformed the entire line into a park with landscaped walkways, benches, places for artists to perform, and overlooks of the city below. One of the neatest things is they left a majority of the original trail tracks in place and built the landscaping and walkways around them. Everywhere you go you can see the tracks below the flowers or built right into the modern boardwalk. Their website has lots of photos documenting the life of the area, from before the railway was built, through the early part of the 20th century, up to the abandoned tracks right before the park was built. Definitely worth a look if you have time to check it out. 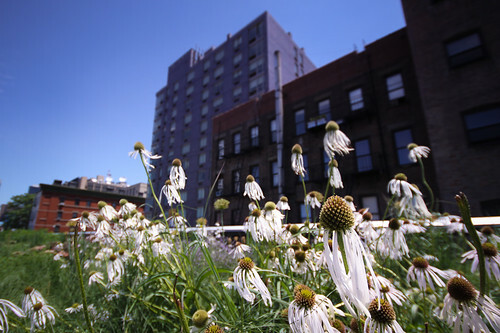 There's also a Flickr group for the Highline as well. Wife and I walked the entire thing from north to south. If you're in NYC and have a chance to visit, it is definitely worth your time.